A native of the Spice Islands, nutmeg is the hard, egg-shaped seed of the nutmeg tree. The flavor and smell of nutmeg is warm, spicy and sweet. It is used in baked goods, custards, white sauces, eggnog and on fruits and vegetables. We recommend buying a whole nutmeg seed and grating it fresh whenever needed. 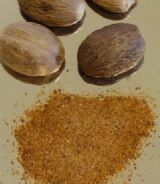 Ground nutmeg loses its flavor quickly, while the whole seed will last a long time.